My Rothko. 2018. Mixed Media on Canvas. 8" x 8"
Walking on Water IV. 2018. Mixed Media on Canvas and Wood. 10" x 22"
Marriage II (made with Virva Hinnemo). 2019. Gouache and Spray Paint on Paper. 6 1/2" x 5 1/2"
Walking on Water II. 2018. Mixed Media on Canvas and Wood. 10" x 17"
My Miro. 2018. Mixed Media on Canvas. 10" x 8"
Hummingbird (for K.M.). 2018. Mixed Media on Canvas and Wood. 9" x 19"
Detail of: Hummingbird (for K.M.). 2018. Mixed Media on Canvas and Wood. 9" x 19"
Marriage (made with Virva Hinnemo). 2006, 2018. Gouache and Spray Paint on Paper. 9" x 6"
Anita Rogers Gallery is pleased to present When Love Comes To Town, a solo exhibition of works by George Negroponte. On view are his mixed media paintings completed over the last several years using house paint, spackle, gesso, wallpaper, dirt, enamel, inventory circle labels, and spray paint on canvas, as well as found objects from the surrounding woods. Negroponte’s works on paper, first begun in Sweden in 2008, were set aside for a decade and resumed this past year in collaboration with his wife, Virva Hinnemo. These small and evocative compositions include truncated shapes, veil-like mists, vehement and nuanced marks, unusual color, and punctuated holes. While all the works are marked by an indeterminable amount of paint, some are diptychs with tree fragments and found objects. Negroponte takes pains to tackle the unlikely reconciliation of incongruent parts. George’s new works are evocations more than representations. They conjure the ephemeral by the simplest, most practical means. They are small enough to feel private to the viewer. Sparse, excruciatingly molded, and relentlessly edited, The “Walkings on Water” go against any rational depiction of walking, as they ground and envelop the viewer in a living atmosphere of air and light. Their levitation is like a child's supernatural powers projected upon the world. The “Marriages” evoke the most essential elements: earth, air, and fire. They are the charmed remains of an always fresh and intensely personal collusion. It’s not that George brings his life into his work: he is so completely invested in both that life can’t stay out, and, in the end, we are graciously invited to see what matters most to him. 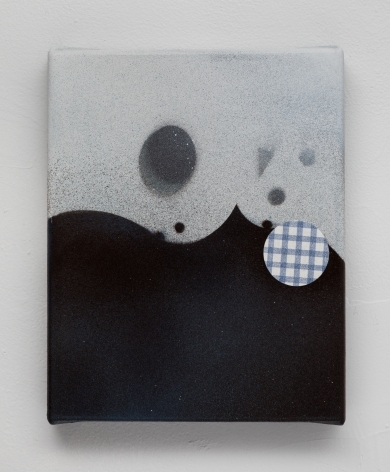 Solo exhibition of works by George Negroponte on view at Anita Rogers Gallery. “When Love Comes to Town,” an exhibition of mixed-media paintings by George Negroponte, is at the Anita Rogers Gallery in SoHo through April 27.